You’re watching your cute Labrador puppy quietly chewing on a toy at your feet. You turn your attention back to your computer screen and suddenly feel little teeth grabbing at your sock! You look down. Your once-angelic puppy is now having a full on game of tug-of-war with your pant leg! This cute baby is now more like a furry little monster. You get up and try to walk away, but the fur alligator is still attached, munching away at your trousers and having the best time! If this sounds like your life, read on to learn how to stop a puppy from biting. Types of Biting: Aggression or Play? Believe it or not, this scenario is actually very common! No, you don’t have the world’s most chewy puppy; you just have a normal one! 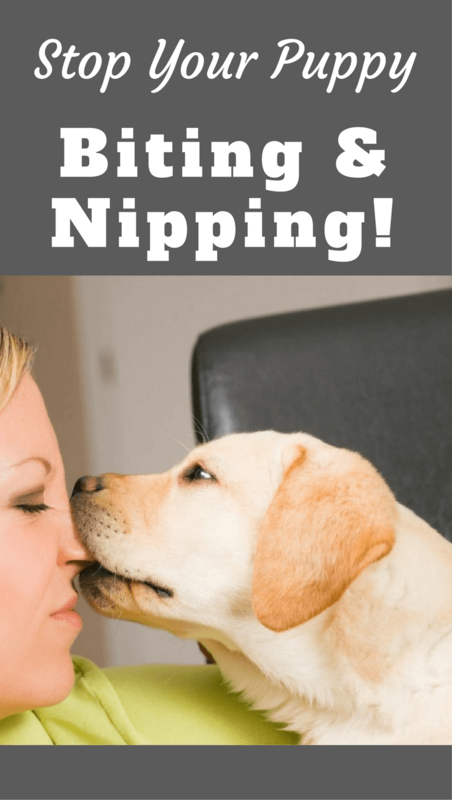 Biting is one of the most natural things in the world to a young pup; and they do it for many reasons. Imagine if you didn’t have any hands to grasp and touch the world? You would be left with your feet and mouth to interact, taste and feel your environment. Now, what if you had puppy paws – incapable of grasping anything? That leaves you with one final way to interact – your mouth. For good measure, add in the incredible curiosity of a child. How many times do you see a baby grab things with their hands and pop them into the mouth? Puppies have that same mindset. Now, imagine that you weren’t able to talk. Your mouth strength and play bite helped you communicate and determine your rank in society. Your mouthy mojo gave you respect in canine culture. You now have a small idea of what it’s like to be a puppy. Puppies interact with their surroundings largely through their mouths. They don’t have hands, but they still have all that curiosity and need for interaction. To further exacerbate the need to bite, factor in you dog’s breed. 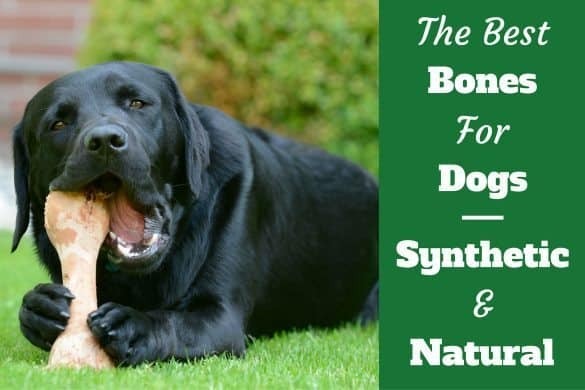 Labradors, like most sporting breeds, have the drive to chase after prey, put it in their mouths, and bring it back to you. This translates into a strong need to chew. Not only do you have the fact that all puppies, regardless of breed, naturally chew; you’ve upped the ante by adding a breed-specific drive to put those pearly whites on anything that moves. If you think that your Labrador puppy is the world’s most mouthy mutt, you’re not alone! Many owners of retrieving breeds feel that their pup’s biting is out of control, but it’s usually just par for the course. Puppies bite to get a reaction! If they’re bored and want to play, all they need to get the party started is to tag their sibling’s tail and a rousing game of chase magically begins! They will try this same tactic with their human pack members. If ignored, one bite on the toe is often enough to get the focus back on them. Remember, to a puppy even negative attention is still attention. When you add teething into the mix, you have the recipe for a furry gator. Most pups will have an increased need to chew while teething, which can begin at 6 weeks and last to 8 months of age. If they aren’t trained to keep their teeth off humans and redirected to other more appropriate chew toys, puppies can mouth well into adulthood. Unlike teething, there is no magical age that puppies grow out of a learned mouthing behavior. Thankfully, with positive training, most dogs eventually lose interest in chewing on their owners. This is why it’s essential to learn how to redirect your puppy early. While it may be cute to have your fuzz ball nip your nose when he’s a bundle of joy at 8 weeks, it’s an entirely different story when it’s a 90-pound boulder of energy flying at your face. If it’s no longer cute in adulthood, don’t encourage it in puppyhood. Puppies use their teeth in many ways. Sometimes, it’s difficult for their owners to read their body language and determine the meaning behind the mouth. When you watch littermates tussle in a ball of fur and fury, it can sound like they’re killing each other. However, this is actually just very intense play. Play biting can be accompanied with growling and snarling. This is just part of the fun to a young pup. We won’t spend a lot of time discussing aggressive biting in this article. Instead, we will look into how we can prevent playful mouthing. However, it is important to recognize the signs of aggression. If you see a hard stare, the hair standing up on their back, lip licking, closed mouth, low growling or a statue-like, tense body posture and then a bite, the meaning behind it isn’t so friendly. Pay attention to the timing of the biting as well. Does it happen after a puppy temper tantrum where you ask the pup to do something they don’t want to do? If so, the motive behind the bite may be more aggressive. Could it be Resource Guarding? Some dogs also aggressively bite when they are guarding a toy or food item, commonly called resource guarding. With resource guarding, you will see the same behavior as aggressive biting, but they will also stand over an object and defend it from any perceived threat. If you think your puppy is behaving aggressively, seek professional help to learn how to actively manage this issue. In contrast to this, playing puppies will be relaxed and have a wiggly body. They will be bouncy, easily roll onto their backs and often be panting with open mouths. Even if they are growling, a relaxed face and body mean a happy puppy. If you’re trying to stop your puppy from biting, it’s a good idea to know what encourages the bad behavior. After all, you don’t want to do something that sabotages your training and confuses your pup! It may be tempting to let that cute little puppy mouth chew on your finger, and it may be convenient to wave your hands around your puppy’s face to entice play, but doing this trains your puppy to associate your hands as a toy. Do you really want your 90-pound Labrador to target your hands as a toy later? Little kids tend to excite puppies more than adults. Children move erratically, run around, make strange sounds and have a lot more energy. Puppies can easily associate them with toys. They often tend to bite more often and harder around children, because the child’s energy and bouncy nature over stimulates them. Again, many parents think it’s cute when their little puppy grabs their toddler’s jacket and plays tug while they are running… until the dog grows about 80 more pounds and suddenly their child is being dragged around the yard! Puppies target fast moving objects that excite their prey drive. Your feet moving by at their eye level can be irresistible. After all, what self-respecting puppy would snub shoes with those floppy laces that are perfect for playing tug? The general theme with all of these biting triggers is to not let the puppy associate your body or your child’s body with a toy. How do we do this? Redirection! When training your puppy, always have a toy to offer. Remember, puppy’s are like babies. They don’t have the reasoning capacity of an adult dog, they are teething, and they have an incessant need to chew everything to learn and explore their world. Your job is to redirect them to fun toys instead of human skin. You must do everything possible to make toys extremely attractive so the puppy chooses them over your clothing, hands or feet. Don’t make jerky or fast motions with your hands, as this makes them look too appealing. You can also use redirection around children. First, teach your puppy to use interactive toys and then show your child how to play with the puppy correctly. Also, don’t let your child run around unless they are dragging a toy to redirect the puppy. If they are running and the puppy starts to focus on them as the main entertainment, it’s time to separate. Always supervise your children and pup’s play to make sure everyone stays focused on the correct toys. In the event that your dog forgets, teach your kids to be a tree when their puppy begins to bite them or their clothes. They stand up straight, fold their “branches” or arms, and look down at their “roots” or their feet and count in their heads until things calm down. This position makes them less interactive to the puppy. They aren’t giving them eye contact. They aren’t moving erratically. They also aren’t making any fun noises. They look boring and the puppy will lose interest. Coincidentally, the “Be a Tree” idea is also a great thing to teach kids when they meet strange dogs or feel threatened. Most bites occur because the child is running or moving erratically. Remember, dogs have the same prey triggers as wolves. If something is running away, it looks like prey. Sometimes, puppies learn to grab hold of the toddler’s clothing and play a game of tug even if the toddler is standing still. In this case, it’s not a bad idea to have a time-out room, which we will talk about later in this article. What about those pups that can’t resist pouncing on your feet? You can’t very well stop walking! Your job, therefore, is to have an even more amazing toy than your feet. You can take a toy, tie it to a rope, and then tie the rope to your belt so that you are dragging the toy whenever your pup is out. If your puppy is coming for your feet, stop moving them and wave the toy around excitedly instead. Once the pup is attached to the toy, you can start walking again. This way, they will pounce on the toy instead of you! Now that we’ve talked about how to not endorse biting, let’s discuss what to do when your puppy makes a mistake. First, it’s helpful to learn how dogs communicate bite inhibition to each other. Bite inhibition simply means that the puppy learns not to apply too much force behind their teeth. In humans, it’s a lot like learning the correct pressure in a handshake. Most people know not to cut off the blood flow when shaking someone’s hand. They apply gentle, but firm, pressure to their greeting. Puppies also learn to limit this pressure with their mouths by feedback from pack members. 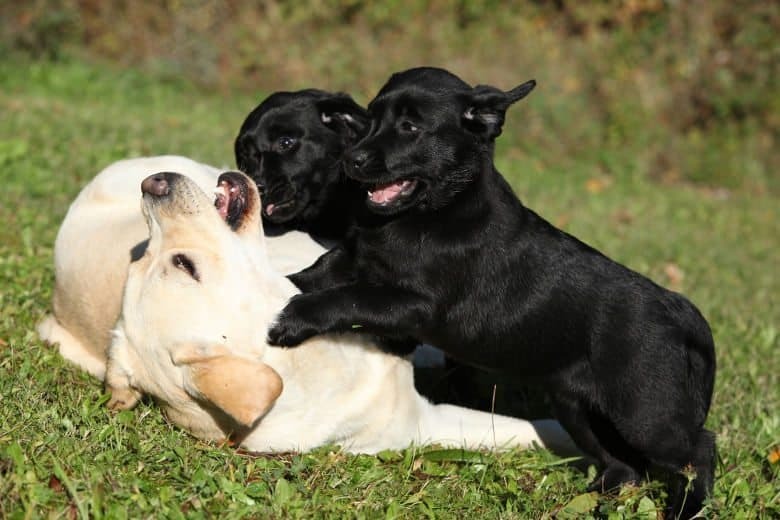 When puppies are little, they learn bite inhibition through play with their siblings. If two pups are tussling, and one bites down too hard, the other puppy yelps loudly. This startling sound usually causes the offending party to let go. The play stops for a few minutes, as the first pup nurses his wounded ego. Play then resumes, but with less brutality. This also happens with the pup’s interaction with their mom. If they’re nursing and they bite down too hard, their mom growls and gets up. This means they don’t get any more dinner. So, the theme with either situation is, “If I bite down too hard, good things stop.” This could either be fun play with siblings or milk from their mom. Now that we understand how dogs communicate bite inhibition, let’s continue this same theme to get the point across to your puppy. You can start bite inhibition by behaving like a littermate during your pup’s playtime. If they bite down hard, make a high-pitched yelp or “Ouch!” sound. When they release your hand, don’t jerk it away, as this makes it look like it would be fun to chase. Instead, let the puppy release your hand and then simply get up and and move away from your pup while ignoring them. Your job is to teach them when they bite down on you, the fun stops. Ignore them for about a minute, then return and resume the play and praise them when they focus on the toy. If they bite you too hard again, repeat this process. If the pup follows after you and initiates play, leave the room so they can’t follow you. You can either step over a puppy barrier or go into another room and shut the door. Just make sure they are in a puppy-proof area, as they may take out their frustration on inappropriate household items. You can also keep the puppy on a leash while playing with them. If they bite you, you can calmly tether them to something and then walk out of their reach. Your goal is to correct the puppy only by taking away your fun presence. You should not be threatening or angry. Give them the appropriate time out from the fun interaction to settle down, and then come back with a toy to redirect their energy. 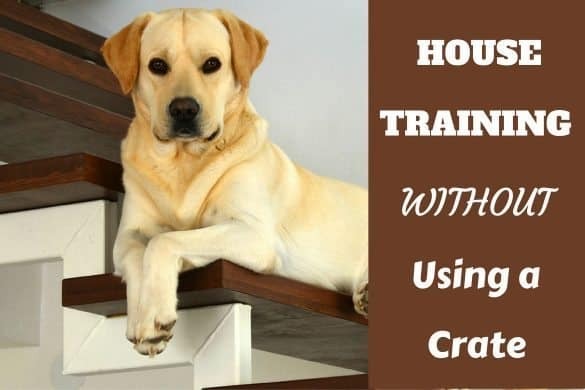 When you’re first starting this training, only react when your puppy bites down too hard. After all, their littermates let them bite in play, so you can’t expect a puppy to understand a zero-tolerance policy just yet. 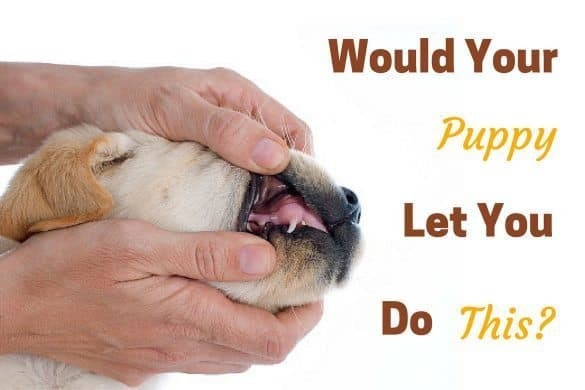 Don’t encourage biting, try to redirect to a toy during play, but if the puppy does mouth your hand, just expect a gentle interaction to start off. Once they understand they have to be gentle, you can then start to ask more of them by ending the game with lighter and lighter pressure on your skin. Finally, you can take the game to the highest standard – no teeth on human skin at all. If you slowly progress to this over weeks, you teach your pup to have a soft mouth. If they do feel the need to put their teeth on a human, they know not to put much pressure into their bite. You need to teach your puppy that human skin is fragile and requires a softer touch than a canine interaction. Your goal for this exercise should be to help your puppy understand that the play and fun things continue as long as they keep their teeth on their toy and not on you! While the yelp and time-out method works for most pups, there are additional ways to reinforce good behavior. If the simple act of losing their playmate isn’t enough to stop your puppy from gnawing on your knuckles, you can actually spray a taste deterrent on your hands. When your puppy bites your hand, they get a terrible taste. You can use anti-chewing sprays like Bitter Apple to make your hands less appealing. When your puppy bites you, be still and wait for them to react to the bitter taste. When they let go, praise them and redirect them onto a treat or toy. If you can’t get your pup to give up putting their mouth on people, you can at least compromise by training them to lick instead of bite. If your puppy simply isn’t getting the message, it’s o.k. to calm them down in a time-out room. You can do this if they just can’t seem to stop biting you even when presented with a fun toy or when they can’t control themselves around your toddler’s pant leg. Don’t use a crate as a time-out room. You want the crate to always be associated with only good things. Crates also should be in the middle of the household, with the rest of the pack – not isolated. When you put your puppy in a time-out room, you are separating them from the pack and from fun things because they can’t calm down. This is the same way other canine pack members would isolate them. A laundry room or puppy pen works well for this exercise. Make sure the room is comfortable and safe for your puppy. When the puppy is too stimulated, calmly put him in the room with some teething toys and leave. Once he’s calmed down, you can let him out. Remember, your goal is to show your pup a better way to play. Teaching them interactive games like fetch or bringing you a toy to tug helps show them that they can have even more fun when they play by your rules. Positive play helps develop a bond with your dog. You never want to avoid it, you just want to show them how to play without biting you. Teaching puppies to retrieve objects helps to tire them out, gives them something positive to chase, and focuses their bite on an appropriate item. 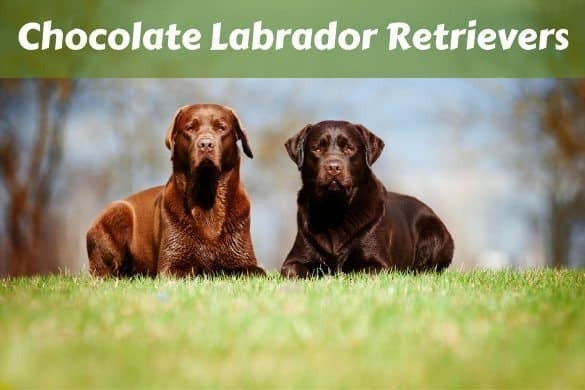 Plus, most Labradors are pretty good at retrieving! Instead of correcting a puppy when they make a mistake, it’s always better to train for what you do want and reward this behavior. Train puppies that a hand reaching for them doesn’t automatically mean they need to open their mouth and bite. The following video shows how. This video shows how to use clicker training to stimulate a puppy in situations where they normally would bite; and then reward them when they choose a closed mouth and calm interaction. Dogs are individuals. Most puppies aren’t trying to challenge you with their bite, they’re just overly excited. However, as puppies mature, there may be the rare pup that uses biting as a way to take charge. Dominant puppies may bite to show you that they want to be the boss as they mature. This happens naturally among littermates, as all packs have a pecking order. If you think your puppy wants to be the boss with their bite, don’t yelp anymore. This reinforces to them that you are backing down and that they are the leader in the relationship. 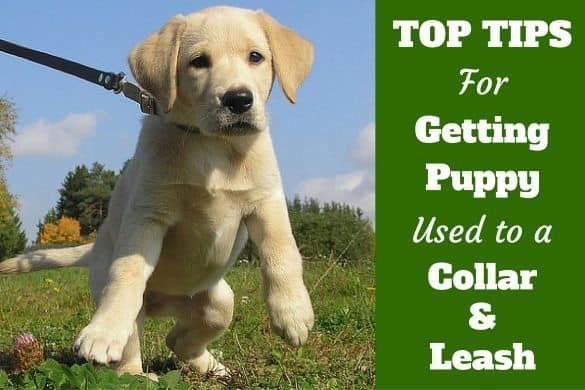 Instead, use the leash to tether the puppy so they can’t get to you or put them in a time-out room. Always remain calm and assertive with your puppy, but end the game as soon as they begin vying for leadership instead of playing. 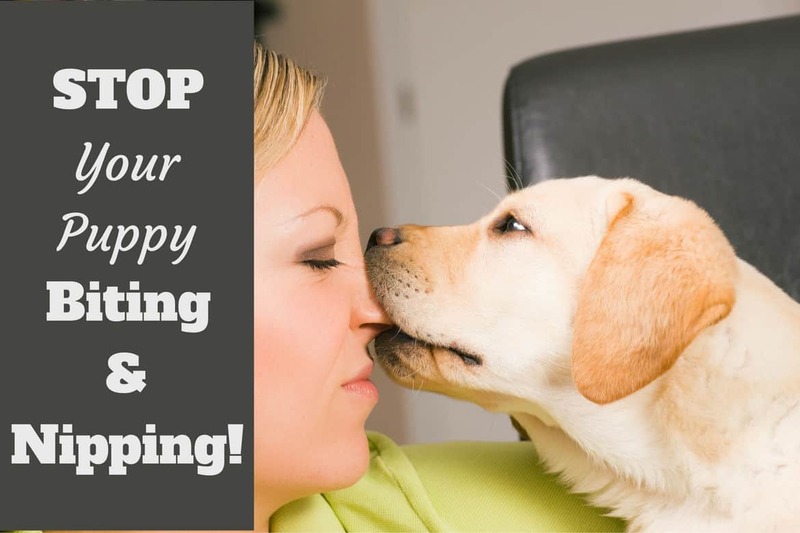 While it may feel like your puppy isn’t getting the message, you will start to see results as long as you stay consistent with their training. Remember, the alternative to not training your dog is a large animal putting his mouth on people. That’s no fun for anyone; and it can also be dangerous! Be patient with your puppy. Remember, mouthing and biting are normal parts of canine culture. It’s your responsibility to show your fur kid how to interact in our human world. If you stay patiently positive, train consistently, and redirect and reward good behavior, you will soon see a puppy that learns to bring you a tug toy instead of shredding your trousers. Thanks for the tip about not yelping – I noticed that our pup became more prone to biting if I helped when she was mouthing too aggressively. I had begun to wonder if my yelping signified that I was like another puppy rather than being in charge. Glad to have found your site. We’re glad you find it useful, Alsion, Thank you! I will definitely use these tips! My puppy never stopped nipping even when you yipped. Hope these new ideas help! Are you attempting to take the toy from him? Then you should stop moving when your pup bites and then, when he releases on his own, offer him the toy or a treat, and praise. 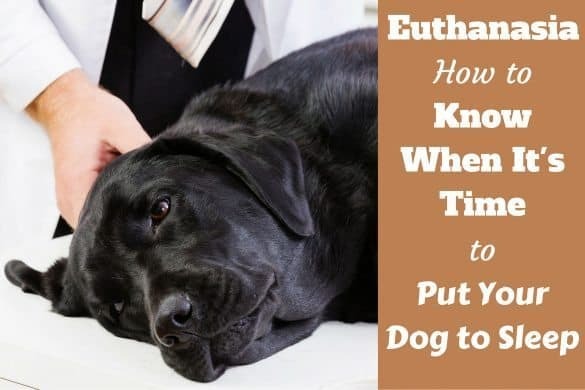 The idea is to teach your dog that good things happen when bad behavior stops.